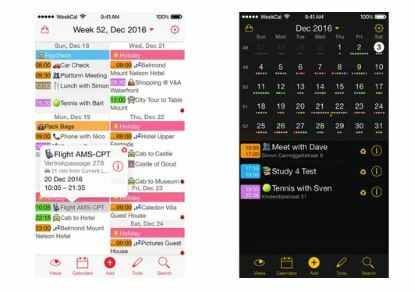 In this article, we have shortlisted 10 of the best Calendar applications for your iPhone. We will be outlining their best features, and if they suit your needs. For your convenience, these apps have been categorized as free or paid. Calendar Apps are a boon in today’s age. With them we can manage our daily lives, from appointments and grocery lists to remembering birthdays too, of course, checking dates. They carry the whole package these days, and every calendar app competes with each other to provide the most convenient, easy to use app packed with the most features. Fantastical 2 is a fast and friendly calendar app, and probably one of the best ones out there for iPhone. Designed to boost productivity, Fantastical 2 has features such as time and geofence alerts for reminders, sending birthday wishes easily, snooze alerts with multiple options, and so much more. For aesthetic viewing, you can choose a light/dark theme and custom Font sizes for yourself. DayTicker is another highlight of Fantastical 2. Managing your schedule has never been more efficient. You can conveniently view your upcoming schedule and swipe to see the past and future, all with a smooth UI. Along with this, Fantastical also boasts its natural language engine that lets you add events and reminders using natural language, and you can even dictate them. 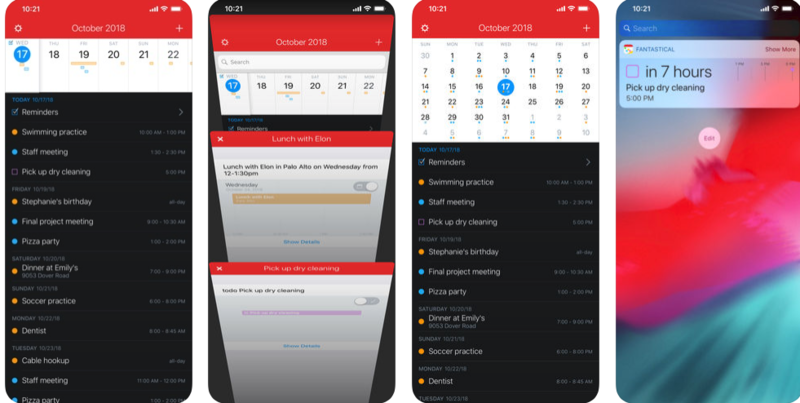 Fantastical 2 has so many other features, including its extremely popular Calendar Extensions, and Apple Watch support that makes it one of the best Calendar Apps for iPhone. Fantastical 2 comes at a price of $4.99 or Rs.400. Get it here. Any.do is a free calendar app for iPhone that is better with its paid plans. Known in the market for its ability to organize your data, events etc. well, this app can do anything when it comes to being a calendar app, as the name suggests. You can easily manage your to-do lists, agendas and goals with Any.do. You can also connect Any.do to your stock Calendar app to manage events. Color mapping helps you keep track of events as you use the aesthetic app. You get notifications for your agendas at the beginning of the day, you can attach location-based reminders, and add in travel time to any notification before any event. In short, if you want to organize your day in the most efficient manner and want to keep track easily, this is the app for you. You can use the app for free or use a paid plan for a cheap $32.88/year with added features. You can visit the website to learn more. Do you have a huge family that you need to manage? Drop your kids to school, go for your son’s football match, remember to buy books for your high school friend, or maybe run family errands? Then Cozi is hands down the best calendar app you can get your hands on. Cozi gives you one unique centralized calendar which you can give access to multiple users. Your family members can have access, or babysitters and such. Color mapping different users makes it easier to differentiate between members and which event is relevant for them. You can get the Cozi Gold (paid version) which adds calendar search, multiple reminders, no advertisements (we all hate that) and features such as a birthday tracker. Cozi Gold is for $29.99, although we found the free version to be just as useful. Timepage has been branded as one of the best-paid calendar apps right along with Fantastical 2 and others. If you are all about a beautifully designed look, Timepage is for you. But Timepage is much more than just a pretty face! It has a minimalist design in which you decide the colors. You can scroll through it up and down to see your daily agendas that can be conveniently updated and changed, and you can easily access month view and app settings. You can opt for a daily briefing and alerts regarding Weather, using Timepage. Without the paid structure, the app only provides a basic calendar, which you get in stock software anyways. So if you want full features, you can have a trial period and then you will have to buy Timepage. Our reviews? It’s worth the price of 1.99/month or 11.99/year. Get Timepage by Moleskin here. Week Calendar is another great Calendar app for iPhone. It does more than just show you a Week Calendar. You can get yearly, monthly and of course, daily agendas. It might not have the most aesthetic design, but it does have tons of features loaded into it, such as easily batch and editing events, searching through calendars, organizing recurring events such as birthdays and color coding them for easy access and organization. Week Calendar comes at a price of $1.99 and you can get it here. Google Calendar does not fail to amaze with a calendar so good and no price tag. An all-rounder, Google Calendar comes packed with the streamlined, aesthetic design of Google and features that bring the guns to the market, such as the creation of multiple calendars in one place with your Google Account, easy connectivity to other apps such as to do lists and whatnot. With light color coding schemes, you can organize events easily, and show or hide calendars according to your will the most efficient event management. And it doesn’t stop here! You can invite other people to edit your Calendar so that you don’t need to share the details with the whole office. Your schedules well managed by this app, we would highly recommend a Calendar App for iPhone so good and absolutely free. For a free calendar app, you can do so much with TimeTree that it is mind-boggling. If you are a person who has immense use for collaboration on a calendar, this is the app for you. It will help you design Calendars for yourself by asking the purpose for the Calendar (such as work, family etc.) and design the Calendar suitably, which is an area where some Calendars fail. With every option having a descriptor, sharing Calendars with your loved ones or fellow colleagues has never been easier. And better yet, you can still create multiple Calendars with the app and conveniently manage them. Overall, TimeTree is one of the best free Calendar Apps that you can get your hands on. If you can’t guess it from the title already, My Study Life is a unique calendar app curated for students and educators. Absolutely free of cost, this app helps manage both a student’s and an educator’s busy and complex schedule. With considerations for semester durations and national holidays, the whole package makes managing a stressful life 10 times easier. You can also use the WebApp, and sync your class timings and dates. You can put to do lists to keep up with your assignments and track progress on them. Not stopping at that, there are also options embedded in this app for exams. In short, for a student or an educator, this is hands down the best Calendar App for iPhone. Get it for free here. If you are a businessman, who needs a Calendar app to have all your information at one place, easily manageable and for your use only, then you have hit Jackpot. Outlook does, however, let you share your calendars with others and manage permissions for the same, to make sure your Calendars are shared within appropriate boundaries. Making appointments for yourself, linking with your email to directly share details to the Calendar are some of the best things Microsoft Outlook Calendar has to offer. Get this free Calendar app for iPhone here. Wave is a quality Calendar App that might not have a big name tag to it but does certainly have features. With a variety of view modes like hard and fast agenda, lists and overarching daily, this iPhone Calendar App is a beast. With quick usage, you can get through making events and to-do lists in flash. Syncing your account with Google and Facebook is also supported by this app. You also get an invitation manager, support for Apple Watch, provision to add tags and attachments and so much more! Make sure to try the Wave app here. Other than these we would also like to mention some great Calendar Apps for iPhone that you can check out: Accompany (free), BusyCal (paid), Saisuke 2 (free), Informant 5 (free), Vantage (free). We hope that by reading this article you were able to make an informed choice about your favorite Calendar App for iPhone, and it is working perfectly for you. If you have any queries regarding the applications mentioned in this article, you can drop us a comment below and we will try to get back to you with a relevant answer.